A caller reported that while riding his motorcycle on North Main Street someone shot with with a pellet gun. A report of someone leaving a child unattended in a car on Iberia Street was investigated. A man reported his vehicle was backed into but was not sure where it happened. 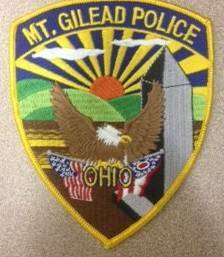 A woman was served an active arrest warrant out of Mount Gilead Mayor’s Court. A man said someone removed his grandmother’s power washer from her Lincoln Avenue residence. A woman said she accidentally called 9-1-1 from an East Center Street address. A report of a man with a knife on West High Street was investigated. An officer spoke to the parties involved, but no arrests were made. Morrow County Squad #1 was in a ditch on South Delaware Street. Officer provided assistance while the tow truck arrived. A woman reported she was assaulted by someone she knows and that person then took her vehicle. The man was located and arrested on an active warrant. A woman said her husband was harassing her via telephone. She was advised to delete his number and stop texting him. A motorist accidentally struck Rite Aid. No injuries were reported. A couple attempted to utter a stolen and forged prescription at Drug Mart. They were arrested on a charge of illegal processing of drug documents. Officers responded to a domestic complaint between relatives on Highland Avenue. One man was taken to the hospital with injuries and the other was arrested.